These little discs are handy landing pads for pretty much anything you fancy. Today I had some left over roast chicken (also in the book) in the fridge; which I sautéed with some sweet onion slices, dry roast walnut pieces and some sliced celery in a little walnut and olive oil. The pancake base ( I covered mine with a pancake hat) added a slightly crunchy interest to the chicken filling. 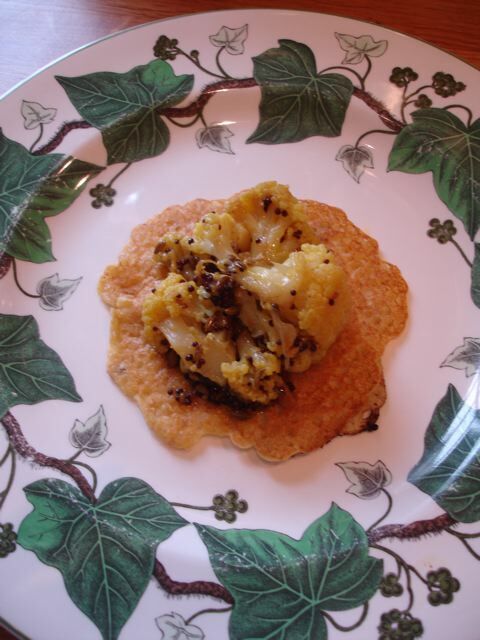 The other day I added the spicy cauliflower recipe from my book—see below–and served a poached egg on the side. 1. Put the flour in a mixing bowl. Add the water and whisk it in until smooth. 2. Add the oil and whisk it in. Add pinches of salt and pepper and the rosemary. You will have roughly half a litre (20 fl oz) of batter. Leave to soak for 20–30 minutes. 3. When you are ready to make the pancake, heat a swirl of olive oil in a 25 cm/10 inch frying pan. When hot, put a tablespoonful of the stirred mixture in the pan and turn the heat down a little. 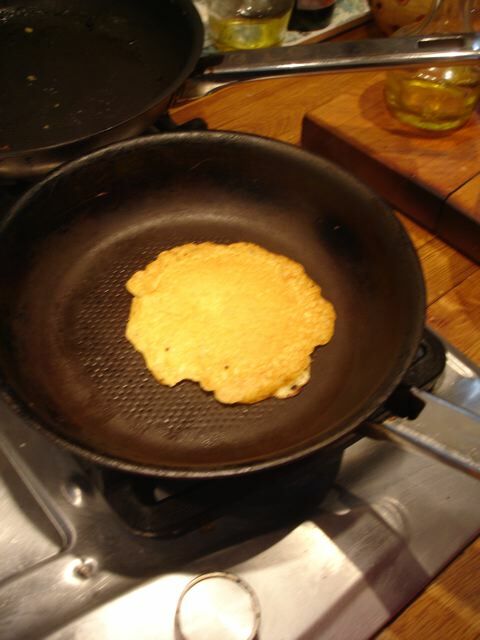 Cook for a few seconds until you can ease the pancake loose with a spatula or fish slice. Now you have to turn it over! Be bold! Practice makes perfect and anyway the first attempt, if not completely successful, will be edible. Cook the pancake a further few seconds and remove from the pan. Both sides should be a golden brown. Add a few twists of the pepper mill on each. * Cook the tomatoes, sprinkled with a little salt and olive oil, for 20 minutes in a low oven (140°C/275°F/Gas Mark 1). Madhur Jaffrey, the Indian actress and cook, brings a touch of the sub-continent to the Mediterranean. This version of her recipe stands on its own and would be good served on the socca pancake or with the “comfort” lentils, and is excellent as a vegetarian main course. 1. Heat the oil in a large sauté pan. Put in the mustard and fennel seeds. 2. As soon as the mustard seeds begin to pop, add the garlic cloves. As they begin to turn colour, add the turmeric and cayenne and stir them in. 3. Add the cauliflower florets and turn them in the oily mixture. Add the water and turn the heat down. 4. 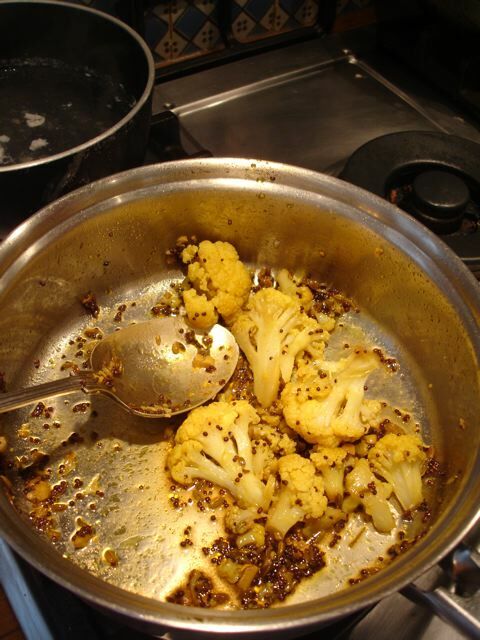 Cook on a gentle heat, covered, for 20 minutes or until the cauliflower is just tender. 5. Uncover the pan and let any remaining water evaporate. Add salt to taste.